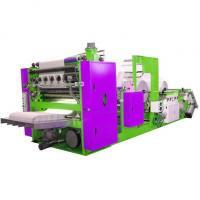 JY-330V Facial Tissue Machine is an alternate folding converting machine for towel paper which carries out slitting, shear cross-cutting and folding from it's parent roll. By containing the alternate folds of facial tissue in the carton, it is possible to produce cartons of pop-up type which can be taken out by the consumer steadily sheet by sheet at time of use, particularly this machine being designed to carry out folding by vacuum adsorption, is a folder capable of fully separating the facial tissue sheet by sheet with quiet operation. The Facial Tissue Machine is capable of attaining a converting speed up to 100m/min this superior equipment MODEL: JY-330V consists of stabilized operation with little trouble, high bulk paper, consumption of parent web decreased and few imperfection, economic installation, etc.